A two way radio is a type of communication that can both receive and transmit information. The radio enables the operators to have conversations with other similar radios operating under the same (channel) frequency. Two way radios are available in stationary base, hand-held portable and mobile configurations. Often, hand-held radios are called handie-talkies, or just walkie-talkies. Two way radio systems normally operate in a half-duplex mode, in which the operator can listen, or he can talk, though not at the same time. A âPress To transmitâ or âpush-to-talkâ PTT button initiates the transmitter when released, hence activating the receiver. A cellular telephone or mobile phone is an example of a two way radio that both receives and transmits at the same time (full-duplex mode). Full-duplex is usually achieved through frequency-sharing methods or by using two different frequencies to simultaneously carry the 2 directions of the conversation. Dynamic solid state filters and use of two antennas are some of the methods used for mitigating the self-interference caused by simultaneous same frequency reception and transmission. 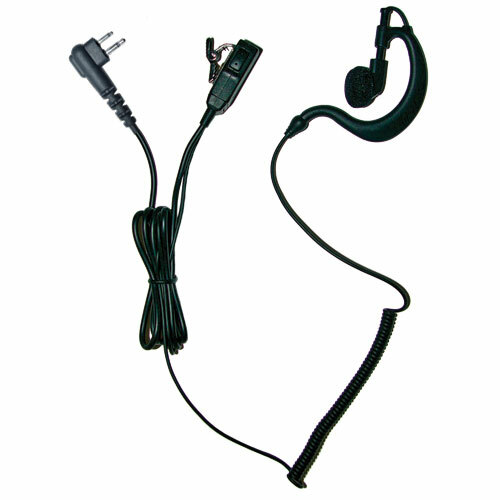 Two way radio earpieces come in a variety of types. They include: D ring, acoustic tube and ear hook. The acoustic tube type features a wireless transceiver operating in a radio-frequency band that receives audio signals. It has an acoustic chamber and an acoustic transducer, which is coupled electrically to the transceiver, and operates to activate acoustic signals. As far as covertness is concerned, communication must definitely be very discreet, whether itâs a just a private group or a security personnel of designated people. Two-way radios are used for conversations between compatible devices in a given location. Nonetheless, it would be much less comfortable if somebody talks through the radio and the entire communication is disrupted. Thatâs why there are different types of two way radios connectors in the world, and they include Motorola, Hytera, Icom, and Kenwood, among others. Motorola is the leading connector of two way radio communications controlling about 45% of the market. It would be super stylish and discreet if you had a Motorola radio-earpiece to accompany your radio. Hytera is another one of the best connectors you can find on the market. Its products are easily available on leading websites with all the necessary accessories. There are plenty of different two way radio earpieces designed by Hytera but most of them come with few accessories less or more. There is not much difference on how they are built or in their quality. One important thing to have in mind is that there are three basic types of two way radio earpiece kits ; the 1-wire, 2-wire and 3-wire. A 1-wire kit and 2-wire kit features a single combined microphone and âpush to talk buttonâ which clips to your collar. A wire with an earpiece then extends from this button, but from the connector on the 2-wire. A 3-wire kit has a wire with a combined âpush to talkâ button and microphone that can be run down cuff or collar. There is another wire with an earpiece clip on it. Other kits have a second push to talk button that clips to your pocket or belt near the radio.